Complete the search form now and enjoy great variety of cheap car rental deals! Explore picturesque landscapes and history of France with car rental Poitiers! Planning a visit to any place is usually a complicated issue as everybody wants to spend time with fun and make a trip memorable. Car rental Poitiers is ready to help you in implementation of your plans in the city. We compare car hire prices of the leading car rental companies to provide you with the best car rental deals! So, get the car rental Poitiers you want for the price you like! Arrange the desirable Poitiers car rental location and check Must Know and Places to Visit with car rental Poitiers! 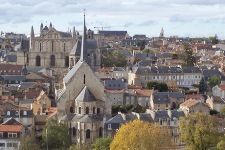 Poitiers is a visiting card of the region of Poitou-Charentes and is the capital of the department of Vienne. It lies on the Clain river. This quiet country town has its own unique character, formed over the years of being the capital of the Duchy of Aquitaine. 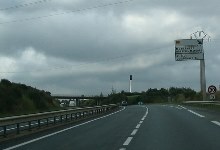 It even looks somewhat different from the other regional capitals of France owing to clear plan of wide boulevards, abundance of palaces and churches, pedestrian areas and gardens, as well as the typical stone-timbered houses, which are somewhat different in their half-timbered style of the north-eastern regions of France. 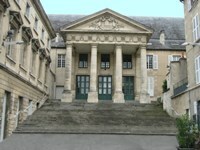 The Church is located in the heart of Poitiers, on the Place Charles de Gaulle. You can get here using your car rental vehicle. This church in the Romanesque style was first mentioned in historical sources in the 10th century, but the building, which we can see now, refers to the 11 - 12 centuries. 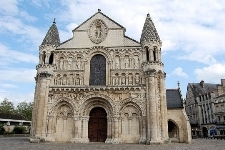 Numerous reliefs of the facade are perhaps the most impressive example of Romanesque art in Poitiers. Poitiers Cathedral stands on the street rue Saint Croix, near the baptistery and about 600 meters south-east of the Église Notre-Dame la Grande. 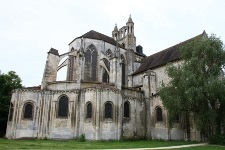 Get car rental Poitiers to see one of the most outstanding examples of rare architectural style – Angevin Gothic. This style was common in the west of France in the 12-13 centuries. The history of the building dates back to the 9th century when Charlemagne restored for his son Louis the Pious the kingdom of Aquitaine and built for him the residence near the city wall. This first building was completely destroyed by fire in the early 11th century, and then the building we can see now was constructed. Come to explore the palace with car rental Poitiers. 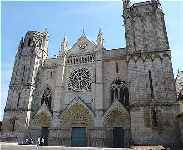 The Abbey is located in the northern part of the historical center of Poitiers, where you can gat with your car rental vehicle. It was built by Duke Guillaume VIII of Aquitaine to get permission from the Pope to marry Hildegarda Burgundy. Abbey flourished for several centuries. However, the Huguenot wars in the mid-16th century brought great destruction from which the abbey has not recovered. The monastery was abolished and it got the status of a parish church. RentalCars24h.com offers you reliable car rental Poitiers services that will help you to feel free and independent when moving around the town. Providing best online prices for car hire Poitiers services, RentalCars24h.com allows you to save money each time when you rent a car in Poitiers.